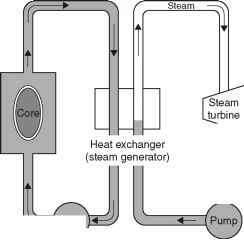 The pressurised water reactor (PWR) also uses ordinary or light water as both coolant and moderator. However in the pressurised water system the cooling water is kept under pressure so that it cannot boil. The PWR differs in another respect from the BWR; the primary coolant does not drive the steam turbine. Instead heat from the primary water cooling system is captured in a heat exchanger and transferred to water in a secondary system. 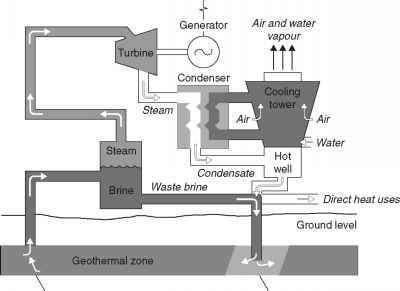 It is the water in this second system which is allowed to boil and generate steam to drive the turbine. The use of a second water cycle introduces energy losses which make the PWR less efficient at converting the energy from the nuclear reaction into electricity. However the arrangement has other advantages regarding fuel utilisation and power density, making it competitive with the BWR. Generator form of uranium oxide pellets. A typical PWR has a generating capacity of 1000 MW. The efficiency is around 33%.